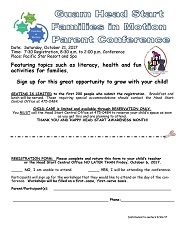 In celebration of Head Start Awareness Month, the annual Parent Engagement Conference is scheduled for Saturday, October 21, 2017 at the Pacific Star Hotel ballroom. Child care is limited and must be reserved. Parents must call the Head Start Central Office at 475-0484 to reserve a slot for child care. Please see attached flyer for more information.